Following the meteoric rise and fall of N.W.A., Straight Outta Compton tells the astonishing story of how these youngsters revolutionized music and pop culture forever the moment they told the world the truth about life in the hood. Excellent performance by the whole cast . Especially Jason Mitchell and O’shea Jackson, Jr. who played the parts of Easy E and Ice Cube respectively. There was alot that happened in the near 10 year time period the movie covers . However, the director , F Gary Gray , managed to create a compelling, captivating and organic story . At almost 2 hrs 30 min, it is a bit too long . Ice Cube: How you go from selling rocks in a dope house to eating dinner in the white house? Whether you are a huge fan of old school 90’s hip-hop , or if you have never heard of N.W.A , ‘Straight Outta Compton’ is a movie you can not afford to miss . It is set in the late 80’s to early 90’s , the streets of Compton, California, were some of the most dangerous in the US , where drug dealing , gangsterism and police harassment were the order of the day . 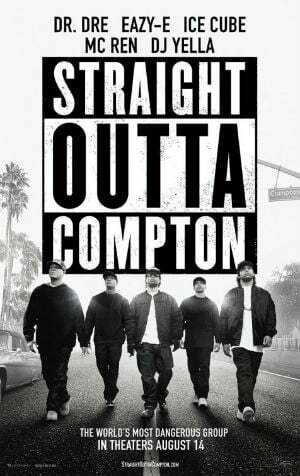 The movie follows the rise of the hip-hop super-group N.W.A , as they face personal and professional trials and tribulations . Particular focus is put on the relationships between Dr dre , Ice cube and Easy-E , as they translated their experiences growing up, into brutally honest music that rebelled against abusive authority.